Extra Desktops is an application that allows to use extra desktops, besides the normal desktop. Use a desktop for storing your downloads, use one filled with your regularly played MP3, use another one for the files of that project you are currently working on. With ExtraDesktops, there is no need anymore to browse to all these folders you regularly use: simply hit a key, and the files are right there on your desktop! The configuration dialog of ExtraDesktops. 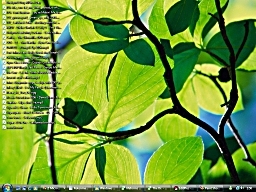 It is also possible to use different styles on the desktop with ExtraDesktops. 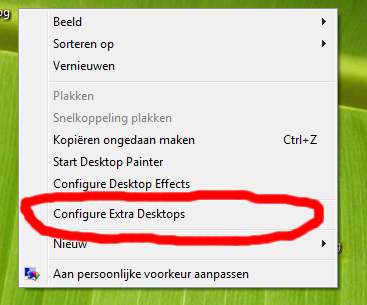 Right-click on an empty space of your desktop and choose the `Configure Extra Desktops' item. After accessing the configuration menu through a right-click on the desktop, you will be able to add new desktops. Shadowed text does not work on all view modes. The configuration dialog is currently only accesible on the main desktop. 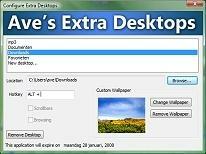 A preview version of ExtraDesktops can be downloaded, that will expire on September 28, 2008. 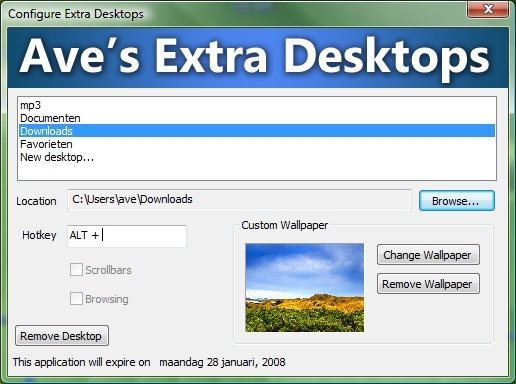 Extra Desktops is copyright © Andreas Verhoeven, 2007.